Llygra, Sloop, 9 tons Mr. John Patten. Was born at Edinburgh in 1850, and educated at Edinburgh Academy and the University. It was in 1871 with a 19-foot mainsail-and-jib-rigged boat that he started his career as a yachtsman. 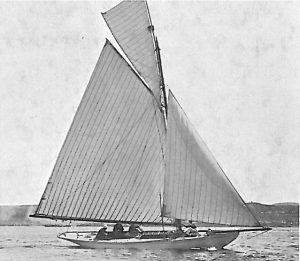 His present yacht, the Llygra, was bought in 1900, and he has raced her consistently on the Clyde, and at Oban and Tobermory Regattas. Clubs: Royal Northern, Royal Clyde, Royal High­land, Clyde Corinthian. Address: Clydebank House-, Greenock, N.B.